Proper storage of hazardous chemicals is necessary in any factory or institutional setting. While small quantities of flammables can be stored in flammable cabinets, bulk or larger quantities of chemicals should be stored in chemical storage buildings. Safe chemical storage begins with inventory management. Proper inventory management is also necessary if emergency personnel are to respond to a fire or chemical spill in the area. Institutions or private facilities can be charged with a fine if emergency response personnel are not provided with an inventory of the chemicals being stored. 1)Segregate incompatible chemicals by hazard class codes. In other terms store chemicals that have the same properties together. 2) Do not store chemicals by size or alphabetical order. 3) Flammable materials should be stored in an approved, fire-rated (for inside), flammable materials storage building or flammable cabinet. 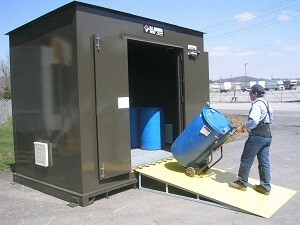 Contact your local fire Marshall for more information regarding indoor chemical storage. 5) Store chemicals on racks or shelving, found inside chemical storage buildings. 6) Do not store chemicals above eye level on shelving or on the top shelf inside a storage building. 10) Store severe poisons in a dedicated poison cabinet – this will avoid storing any incompatible chemicals with poisons. 11) All chemicals must be properly labeled and dated. Ensure parts and accessories are operating properly. Lack of lighting or light bulbs. Any sign of static electricity. To learn more about proper chemical storage contact US Chemical Storage online or call 800-233-1480 for a free chemical storage consultation.